Yordano Ventura bounced back from a sprained ankle to provide a quality start but it was not enought as the Kansas City Royals dropped the series opener with Seattle 3-2 at Kaufmann Stadium Friday night. 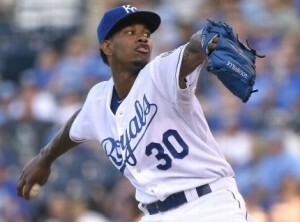 Ventura, who left his last start after just two and 2/3rd innings, tossed seven inning allowing three runs on six hits and struck out five. Ventura’s wild pitch allowed Seth Smith to score in the sixth. Catcher Salvador Perez threw the ball away trying to get him out at the plate, allowing Robinson Cano to score — the star catcher was given an error on the play. Salvador Perez smacked his 13th home run of the season in the loss.